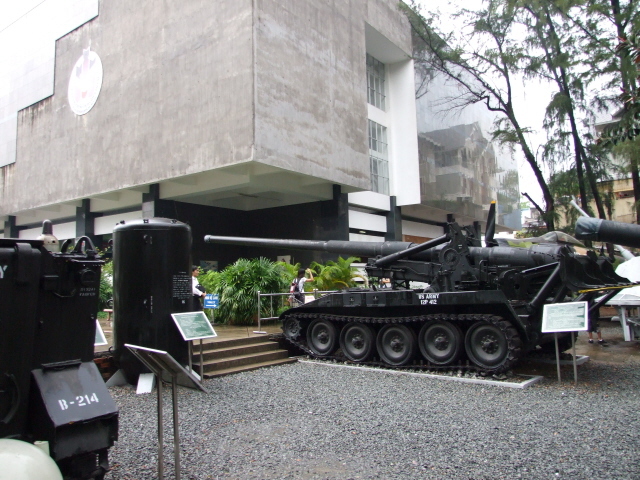 The principal museum about the Vietnam War in Vietnam itself. And it's drastic, in some parts extremely graphic, and certainly one of the darkest museums in the world (and accordingly in the Top 20 list of dark tourism destinations). More background info: If the name of the museum strikes you as somewhat odd, you're right. It's not the museum's original name. It used to be called the Museum of American War Crimes, but as a nod to the growing number of American tourists, the name was toned down, first to the shorter War Crimes Museum, then to its present name. Inside, however, it's still what it's always been, and the war crimes committed by the USA during the Vietnam War are documented in drastic detail. This seems to be too much for some American visitors, going by the museum's visitors' guestbook. One angry entry by a US visitor read: "pure propaganda! ", to which another guest added the meta-comment "Ignorance – when will we learn?". The museum is astonishingly popular with foreign tourists, it's probably the No. 1 tourism draw these days, at least as far as museums are concerned. That means that at peak times you often have to queue and wait until you can view a particular exhibit or read a text panel. It's a bit at odds with the museum's sobering character, but can't be helped … you could maybe try going very early to beat the worst of the crowds. What there is to see: a lot. And it's often tough going. The museum is arranged in a series of buildings around a central courtyard. The latter is filled with all manner of military gear: tanks, guns, UXO, a helicopter and fighter planes. It's inside the exhibition rooms that things get tough. Be warned from the outset: it's not for people of a weak disposition. There are lots of stomach-turning images. In one room it's mostly photos shot by war correspondents, including a number of famous images you will already be familiar with, but also more shocking ones you may not have seen before. A particularly graphic photo shows a GI holding up parts of a Vietnamese man who had literally been blown to pieces: the "parts" are an unidentifiable mangled mess with a head dangling from it …. Especially grim is also a photo of grinning GIs posing with the heads of decapitated Vietnamese. There are also pictures of American soldier victims, and others showing the despair and exhaustion on their faces. 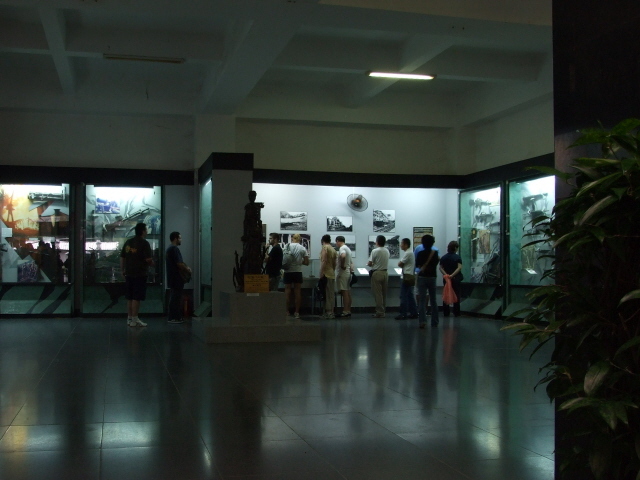 In the main building, you get to the heart of the matter, the museum's central and original theme, the war crimes committed by the Americans in the Vietnam War. The My Lai massacre gets a mention, of course, as does the use of chemical warfare. The effects of phosphorus and napalm are graphically illustrated. A particular focus is also placed on the defoliants sprayed over Vietnam, of which the so-called "Agent Orange" is the best known and most widely used variety. These chemicals contained dioxin, which led to long-term poisoning and to birth defects for decades after the war was "over". It's not "over" for the Vietnamese people. The photos of grotesque deformities are particularly hard to stomach. But for most visitors the gruesome "highlight" is the display of deformed and fused together foetuses, preserved in formaldehyde. The use of pellet grenades and nail bombs is covered too, as is the topic of landmines and UXO, which to this day maim and kill civilians. Again, you see that for Vietnam the war isn't quite over yet. Another artefact on display is a piece of a wing of a shot-down B-52 bomber. These heavy strategic bombers were used in carpet-bombing campaigns that literally changed the landscape of the affected areas. Aerial photos of pockmarked land are complemented by close-ups of the huge craters that were left behind. Needless to say, such carpet-bombing did not only kill directly, but destroyed crops and farmlands, i.e. the livelihood of the civilian population. That was, of course, the point … whatever euphemism there may be for it. 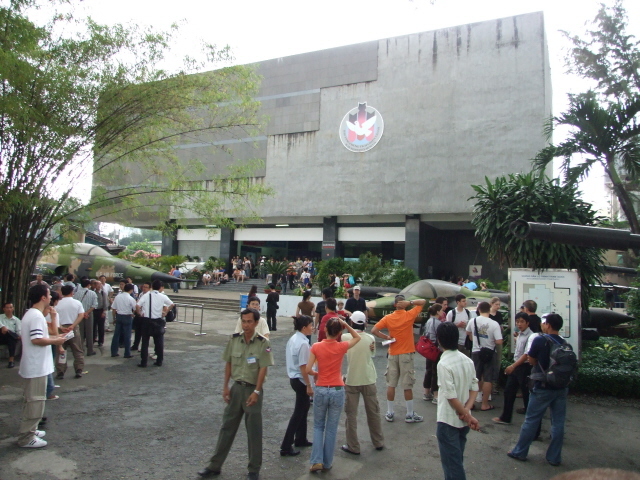 To the side of the main building is a section that is slightly out of context in that it illustrates the prison system in South Vietnam (prior to its "liberation"), which involved so-called "tiger cages" – small cells with ceilings also made of bars so that guards could literally walk over the prisoners. On display is also a guillotine, inherited from the French colonial penal system and allegedly still in use until 1960. In another annexe, posters and photos illustrate the anti-war movement that the USA's involvement in South-East Asia generated, both in the States and internationally. There are photos of anti-Vietnam-War demonstrations in cities such as Vienna, Austria, and Hamburg, West Germany, and posters condemning the War from the GDR (the latter took in many Vietnamese refugees, and thus had a particular link to the country). Text panels and labels are in part multilingual (with Chinese and Japanese often added more recently), but everything is at least bilingual, in Vietnamese and English (of mostly decent quality). 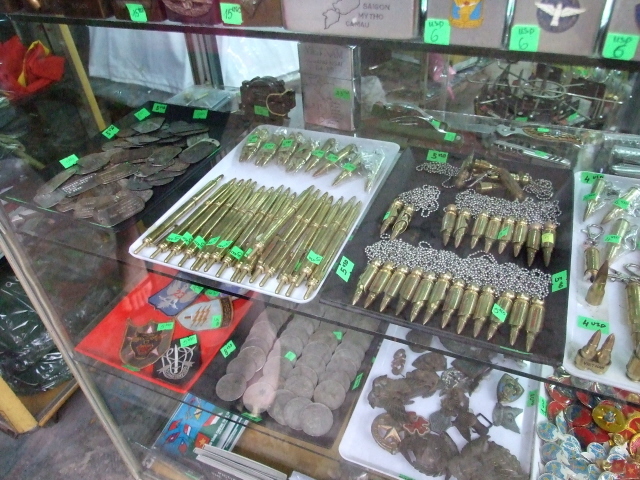 The souvenir shop on the premises offers postcards, books and a wide range of "gifts", including old ID "dog-tags", medals and key rings made from bullet casings ("full metal jacket" springs to mind). Not all necessarily in good taste, but also evidence of Vietnam's new-found modern-day commercialism. 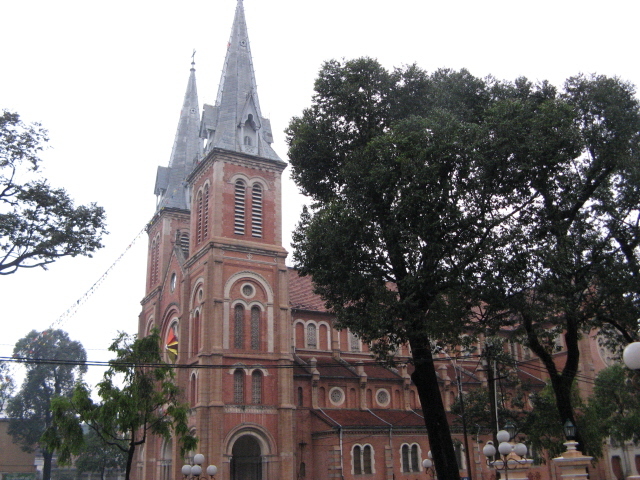 Location: in central Ho Chi Minh City, Vietnam, at 28 Mo Van Tan St, in District 3, not far from Reunification Hall. Access and costs: quite easy to get to, cheap. 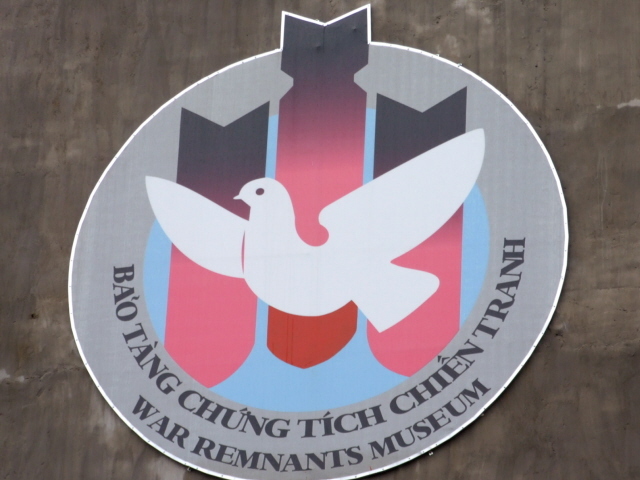 Details: The museum is just a block north from the grounds of the Reunification Hall which dominates a large square in the centre of the city, and which itself is just round the corner from Saigon's liveliest central street Dong Khoi. 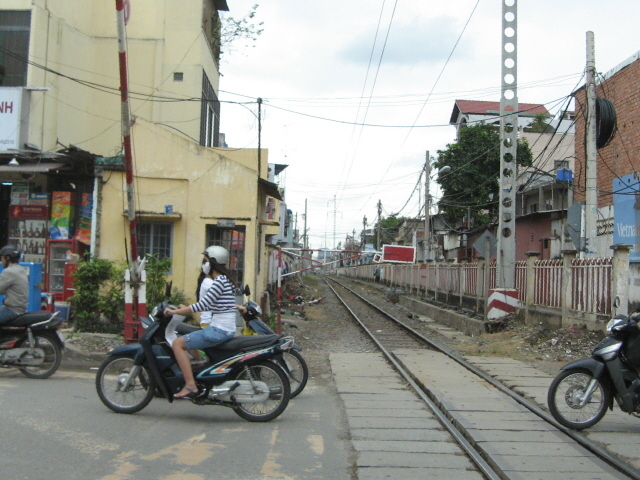 So it's easily walkable – or take a cyclo or taxi. Time required: more than you might think, about two hours can easily be spent in the museum, quite possibly more. Combinations with other dark destinations: in general see Vietnam. 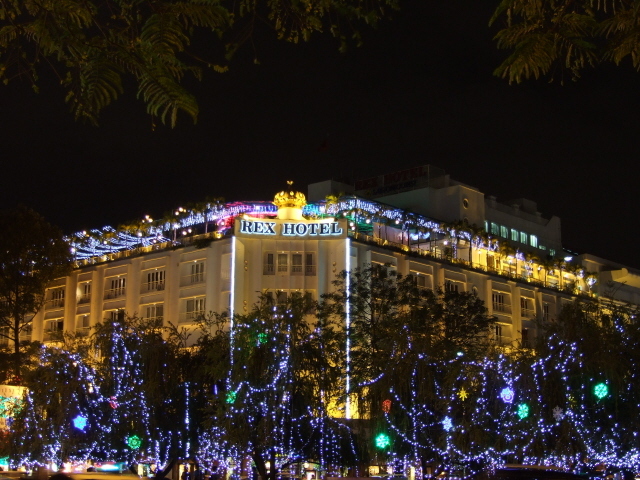 Within Ho Chi Minh City you may want to have a peek at the Rex Hotel – it was the place where during the Vietnam War the US military held their daily press briefings reporting about their alleged progress (sarcastically dubbed "The Five O'Clock Follies"). 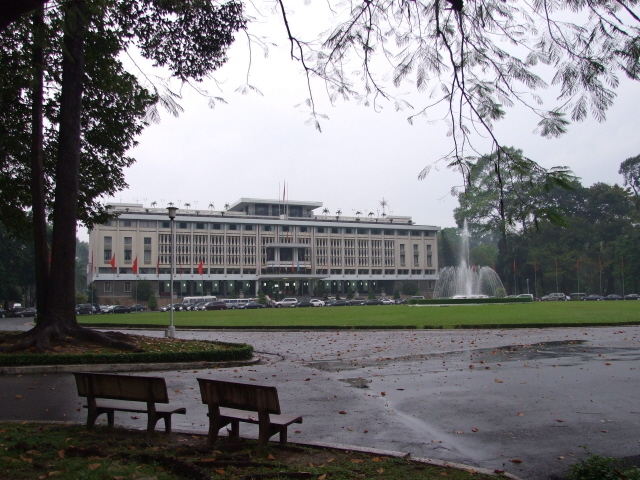 Also worth a look is the Reunification Hall, previously the Presidential Palace. This provided some of the most famous images of the war: that of the helicopter that evacuated the last South Vietnamese president from the building's rooftop before the North Vietnamese troops could get hold of him (something later recreated by Ceausescu in the Romanian revolution of 1989). And that of a North Vietnamese tank breaking through the Palace's fence. Outside, two tanks are still parked in the grounds, now as a memorial. 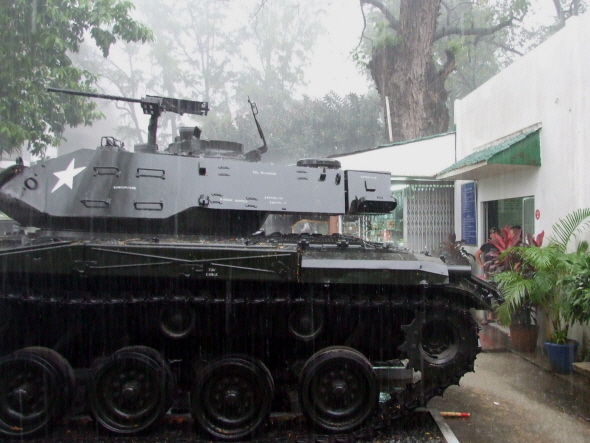 One of the tanks that broke into the Palace grounds is now on display at the Military Museum, the smaller and less significant war museum in addition to the bigger and better War Remnants Museum. 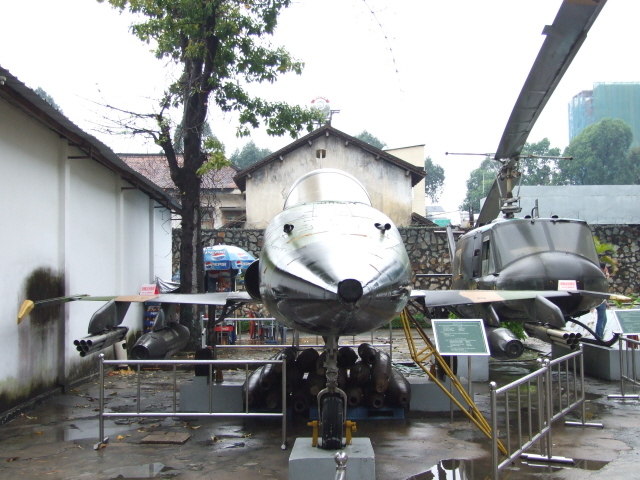 Another open-air exhibit is an American F-5 fighter plane (allegedly with its onboard 20 mm machine gun still loaded). 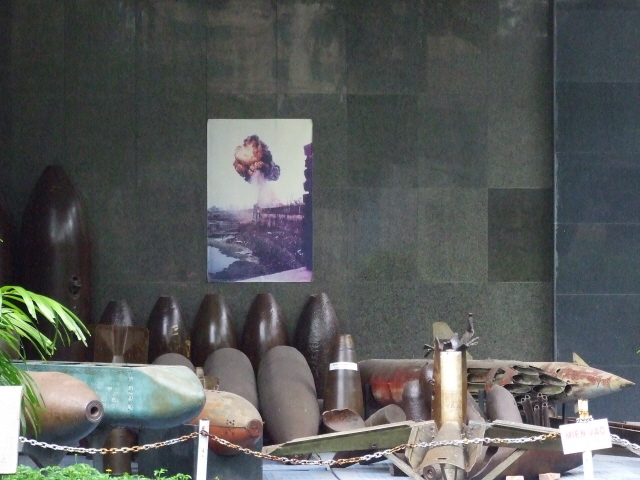 Ho Chi Minh City obviously also has to have its own Ho Chi Minh Museum (at 1 Nguyen Tat Thanh, District 4). Further afield, going to the Cu Chi tunnels will most naturally combine with a stay in Ho Chi Minh City, as they are not far out, actually still in the city's larger district area. You can even do them en route to the airport (but make sure you have a change of clothes packed in your hand luggage, because at the tunnels you may get dirtier than you would want to be in an airport or a plane! ).